Before I get into the stack (literally - a STACK) I received recently, let me request a call to arms and mailings from the blogosphere. Chris' Old Foul Cardboard blog is slowly coming back to life. He put out a request for some cards to a couple kids he coached during a ball season. 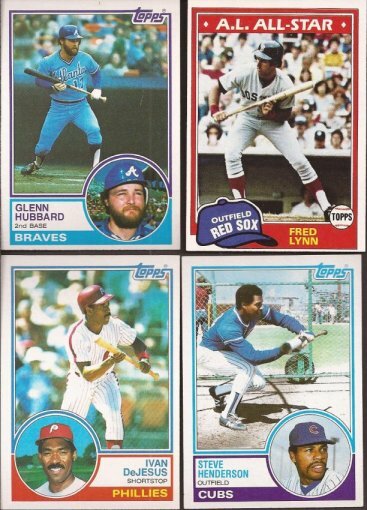 Now, I know we all would love to get some cards to some children still excited about the hobby. So please - read the post, email Chris and let's make it happen. Ok, so now that you have cleared out your stacks to the kids, let's see the stack I recently received. I use the word in the proper literal sense and not the figurative sense. See - that is a stack of cards. Johnny from Johnny's Trading Spot dropped a small flat rate box stuffed to overflowing with cards. But not just a mass of randomness. Every single card I received was a bunting card. 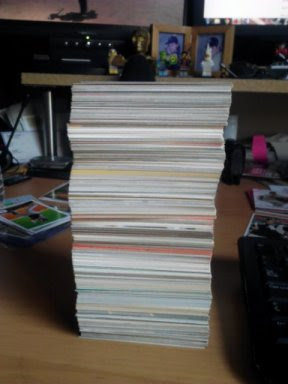 In that stack is over 400 cards. Granted, a lot are dupes from what I already have in my collection, but Johnny hit me so hard I needed to start a 2nd bunting binder. Out of the 400 cards, 118 were new unique cards for my customer collection. With all the new additions, I am close to a thousand cards showing a player bunting. Sorry Nick - hope you don't need these. At the least, you can find these for your pitcher at the plate and add them to your next Just Commons order. Lieber looks scared trying to lay one down. Or he needs to use the little boys room. Vintage-y!!! Hubbard was a card on deck for the baker's dozen. And the Lynn....that is pure beauty. One serialed card in the box. I really wonder if the /99 print rate on these is accurate. I rarely see these online and have pulled a grand total of one gold card from a UD product. 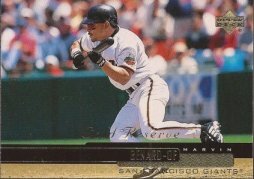 Now I have to find the base of this card. With such a huge stack of bunting cards, I went through to see who was represented on cardboard the most in a bunting position. This is by no means accurate, as it is only based on the stack of cards Johnny sent. 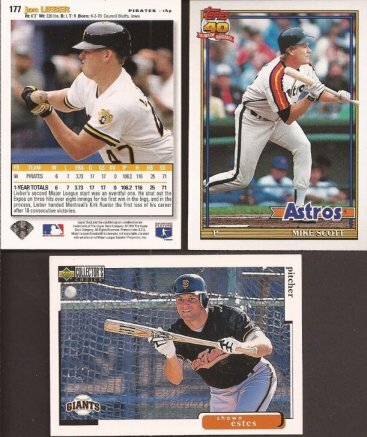 I feel confident, though, the person in position #1 probably has the most bunting cards in production. But we'll get to that is time. 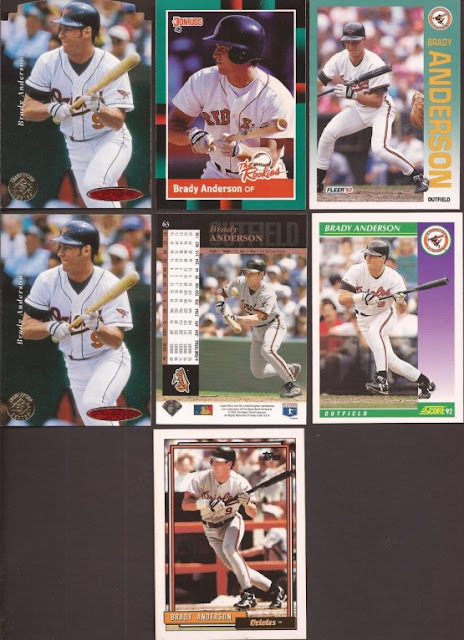 Third most player with bunting cards in the stack was Brady Anderson with 7. The two cards on the left look identical, but the top one is die cut. 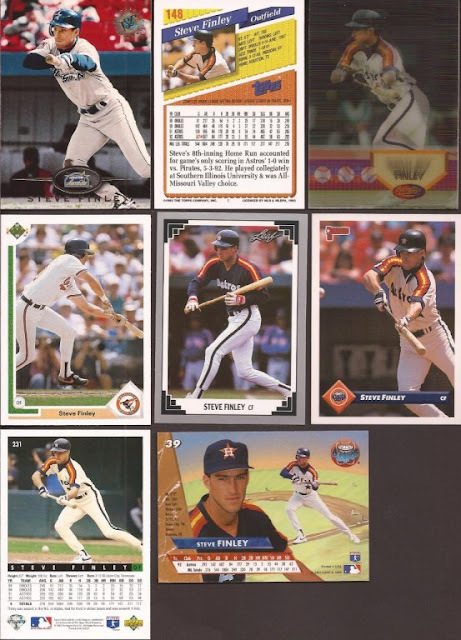 Runner up was Steve Finley with 8. Sportflics sighting in the top right. 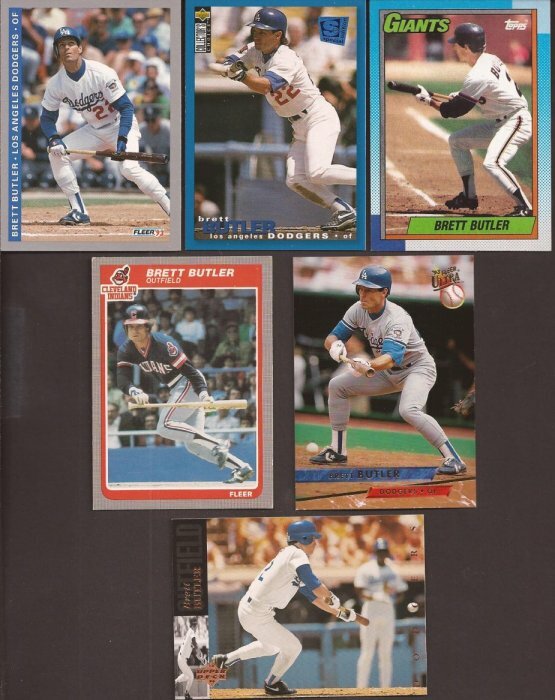 But the king of this package in Brett Butler. Butler laid down a lot of bunts. An insane amount of bunting cards. In fact, I have 21 cards of Butler in the bunting binders. Was he really that fast down the first base line? Dodger collectors - answer? Many seem to be drag bunts. Thanks a ton for the cards, Johnny. If anyone wants to start their own bunting binder, send me an email. Seriously, I have a ton of cards I would be more than happy to send you. Butler beat out a ton of bunts. He was quick, although not exceptionally so, I think he just knew the craft very well. 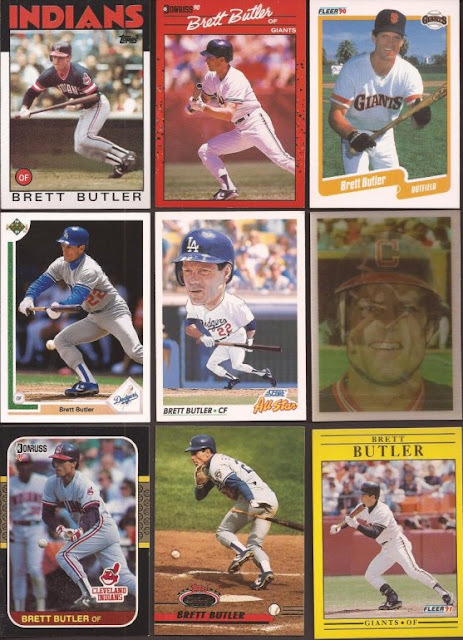 The big head Score All Star card of Butler bunting is one of my favorites. Butler was a bunting master craftsman. Broadcasters still mention his name in bunting situations! Most steals by a white guy in the post-integration era, so he was definitely quick.